From the very beginning, the ghetto was considered a temporary refuge for the Jews. 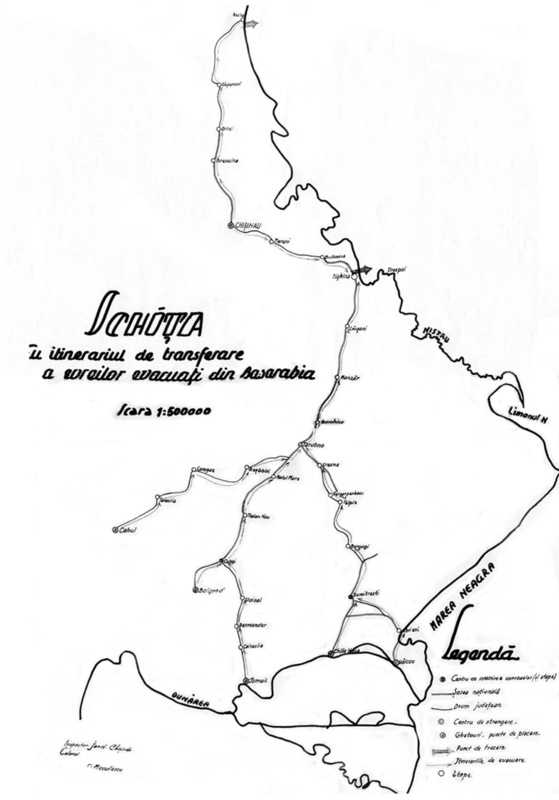 The aim of the Romanian authorities was to “cleanse” Bessarabia and Bukovina of “the Jewish elements” via mass deportations across the Dniester and their concentration in the camps of Transnistria. The first instructions for deportees were issued in September, but they began to be implemented since October. From October 8 until the end of the month, the deportations were carried out. It was conducted in several stages. People were driven, mostly, on foot. 100 carts were allocated for every 2,500 people. The chairman and members of the Jewish community appealed to the military authorities and begged to change the ways of the ghetto evacuation, but all was in vain. The desperate attempts of the Romanian Jewish community to prevent deportation were unsuccessful. There were two evacuation routes: Chisinau-Rezina (80 km) and Chisinau-Tighina (Bender) (56 km). Columns of 1,500 people passed it in four days. At the 6th kilometer from the city, on Orhei Highway, the convoy stopped each column, and employees of the National Bank of Romania seized the prisoners’ valuables and money, issuing bonuses in return. 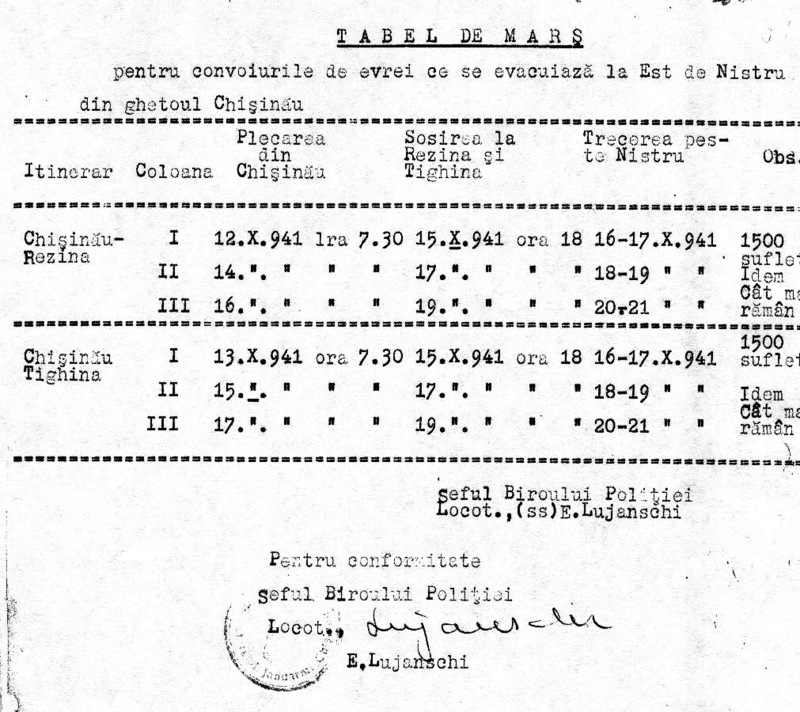 When crossing the Dniester, Romanian soldiers and officers again searched them. The carts often broke, and the column stretched for several kilometers. This made it difficult to protect and fostered the robbery of Jews by gendarmes and local residents. The drivers threatened or plundered the property from the Jews who most often did not complain because of fear, peasants and vagabonds participated in looting along the deportation routes. On the way to Rezina, several peasants came to the column and robbed the Jews on carts. The convoy caught them. On the way between Visterniceni and Orhei, locals tried to attack Jewish carts to rob them. During the deportation, Sergeant Saftenko offered rooms for sleep to those who were obliged to spend the night in Rezina for various amounts of money. The way to the camps was a real “death march”. Jews went with their belongings, subject to humiliation and robbery. At night they slept on the ground, already in the cold autumn. Those sick and old, unable to move, were killed. Some were killed for the purpose of robbery. .Tabel nominal de evreii din Chisinau carora li s-a aprobat ramanerea pe loc. 10 names on the list – these people and their families were allowed to stay. Three of them are former deputies of Sfatul Tsarii (Sadogursky, Davidovich, Gutman Landa). Other specified reasons, apart from the deputies who contributed to this decision, are merits to Romania, not Bessarabian origin, orphanhood, etc. Several dozen Jews who remained in Chisinau were not deported because due to various reasons (diseases, special permits). 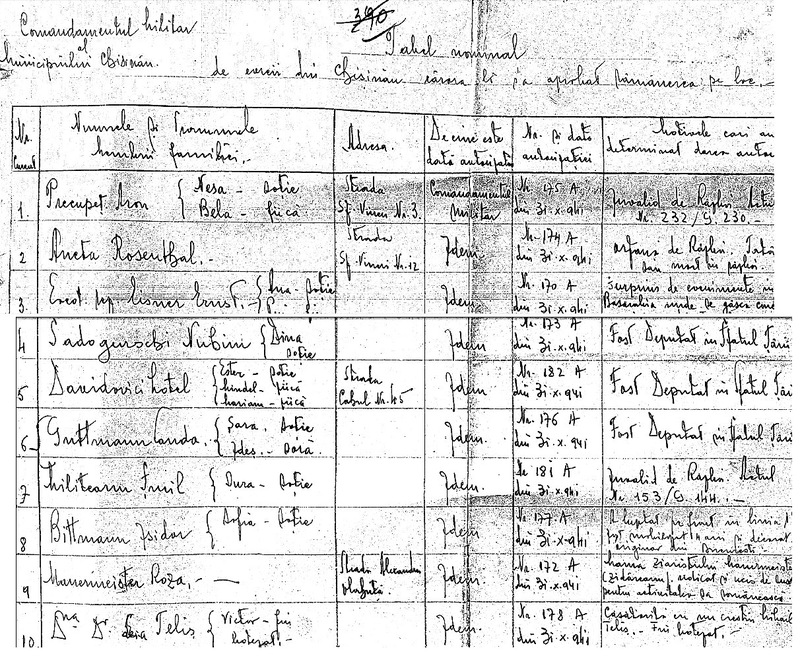 On March 30, 1942, Ion Antonescu ordered the resumption of deportation. At the time, there were 657 Jews in Bessarabia, 257 of them in Chisinau. 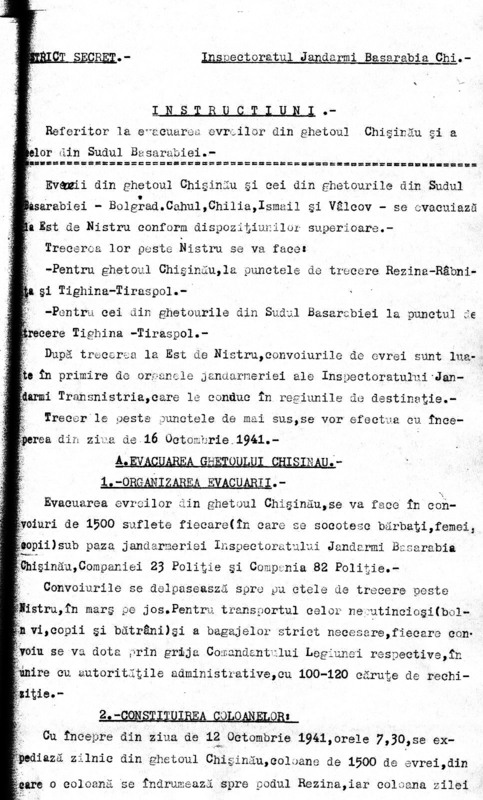 After sending еру prisoners across the Dniester, guards of the Chisinau ghetto appropriated remaining furniture, shoes, clothes, linens, dishes, kitchen utensils. 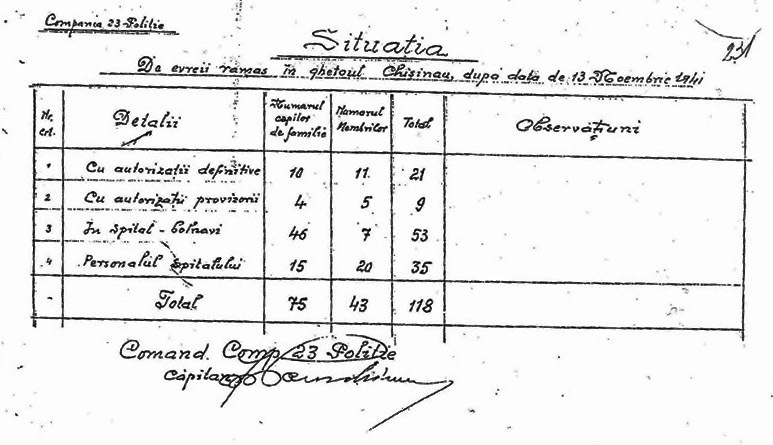 The last transport of Jews was sent from Chisinau on May 20, 1942. At 6.30 am representative of the Office of Romanization of the Governorate of Bessarabia inspector Andriyash came in the ghetto with 20 employees, trucks and wagons. The delegates of the National Bank of Romania searched 204 prisoners – among them were former members of Sfatul Tsarii, large owners, officers of the Romanian army – discovering gold and jewelry for 1.2-1.5 million lei and 800 thousand lei in banknotes. Then the prisoners were sent to death in the camp of Vradievka. The search for hidden treasures was continued in the ghetto. On May 25, 1942 in the basement of the house of businessman Solomon Shur a cache of jewels worth 25 million lei and 280 thousand lei Romanian banknotes were found. 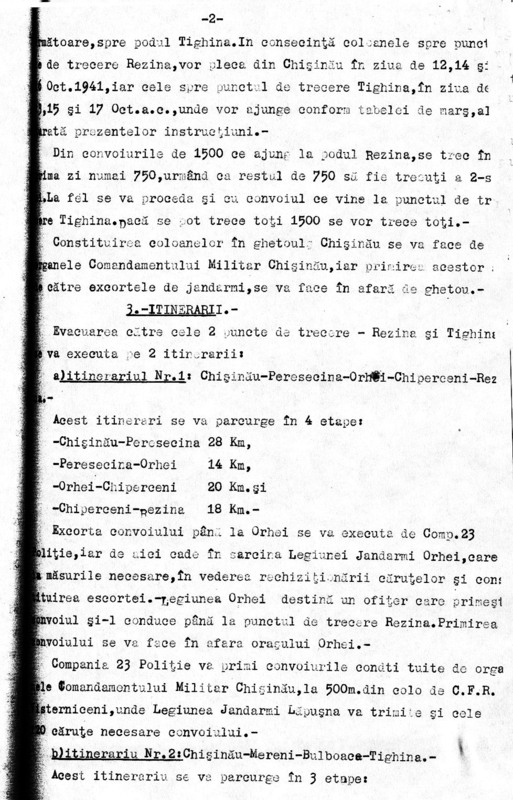 On June 30, Governor Voiculescu registered the official closure of the ghetto in Chisinau. Thus, it existed almost a year, from July 24, 1941 to June 30, 1942. Chisinau ghetto. Help from Bucharest.